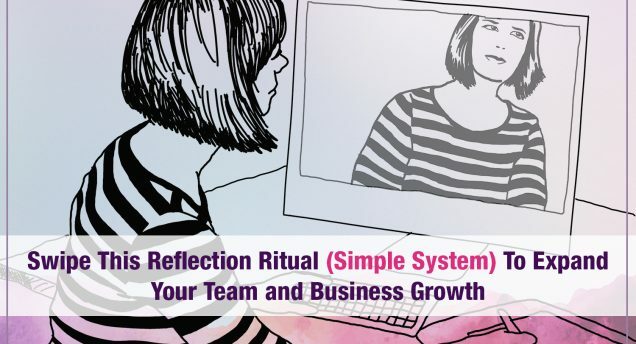 The Reflection Ritual is a simple system that solves one of the greatest challenges evolved business leaders experience today: providing consistent, structured, and meaningful feedback to support their team’s growth in alignment with the company vision and core values. This tool was born out of need as my company and team started to grow, and I wanted to continue coaching my team members but didn’t have the bandwidth (or the skills) to do so effectively and consistently as we expanded. When we first started our agency Vision Tech Team with about half a dozen people, my partner James Guldan and I were actively doing one on one meetings with each team member every other week, checking in on how they were doing, offering coaching for growth, and getting feedback on how we were doing as a company and what we could improve. As we grew, it became increasingly difficult to scale and track these conversations. When we did briefly canceled the meetings for a while to free up our schedules, we quickly noticed we had less of a pulse on our business and less connection to our team members, especially as we grew. So we innovated and designed a simple and scalable system that allows a similar process to take place with a lot less time commitment for everyone (including each team member), improved accountability, and increased self-reflection. Every two weeks, right before payroll, each team member fills out a form answering specific questions that inspire insights, feedback, self-reflection, and an opportunity to ask for support. We started doing this right before payroll to keep everyone accountable to filling it out consistently, and at first told people “if you don’t fill this out on time, you don’t get paid on time” – and we actually stuck to that. As you apply this in your organization, you can modify the questions to reflection what’s most important to your company. On a scale of 1 – 10, what is your current stress level at work? On a scale of 1 – 10, what is your current happiness level at work? What would increase your happiness at work? What have you learned over the last two weeks (in relation to your learning track or otherwise)? What have been your biggest challenges over the last two weeks? What have been your biggest accomplishments over the last two weeks? How are these accomplishments reflective of at least one of our core values? What do you intend to learn over the next two weeks? When we first started this process, my co-founder and I would give direct feedback to each team member. As we grew, we put managers in charge of their own departments. Our Design Director replies to all designers, our CTO replies to our developers, James and I reply to the managers and to each other. This makes the system more scalable and improves the leadership and coaching abilities of our management team. The Reflection Ritual addresses one of the biggest challenges many organizations face: leaders don’t give consistent feedback to their teams outside of quarterly reviews (at best), so most employees don’t know where they stand, and entrepreneurs (especially those who aren’t great managers, which includes a lot of us) don’t know how to give consistent feedback without being confrontational, often until it’s too late. This process also helps to keep a pulse on our organization. We flag any high stress levels or low happiness levels, or other concerns to discuss in coaching conversations. We gain insights of where we can improve our culture and support structures, so that our initiatives are based on actual data and feedback from our team. When we do one on one or group coaching and mentoring meetings with our team members, we often source many of our topics from these Reflection Ritual answers, giving us a foundation for our inquiries and bringing us closer to solutions. Beyond the interaction, answering these questions alone encourages increased self-reflection – like a journaling process, where the questions themselves inspire solutions, and they can look back back on their own answers over time to track their personal evolution within your company. As you apply this to evolving your own team, please comment below with your results! Side note: Dmitriy (along with Yanik Silver) will also be teaching the Evolved Startup Live Classes, sharing his all of his expertise in recruiting, training and retaining a great team to bring your mission to the marketplace. It’s all part of the Evolved Business Blueprint and sparking 10,000 ideas to change the world.